It’s early April, and Tomek Kniat stares at his computer screen in the basement of his Scarborough, Ontario, home. His usual desktop image of a polar bear with gentle eyes is covered by a graph that zigs sharply higher and higher, reaching peaks that were foreign to Kniat only three or four days earlier. Is this really happening? he asks himself. He’d been checking Google Analytics a few times a day since he launched the English-language section ofGazetaGazeta.com five months earlier, and he expected traffic to go up 20 or 30 percent with a big story like this—not more than five times its typical views. If the traffic keeps going up like this, he worries, we will be in trouble. Normally, a huge spike in web traffic is a gift, not a curse. But given the modest resources of Gazeta Gazeta, one of the most successful Polish language newspapers published in Canada, this sudden surge might have been too much of a good thing. Certainly, it was more than Malgorzata Bonikowska, the publisher and web editor, and Kniat, the advertising agent, webmaster and bookkeeper, could have anticipated when they began posting English-language news about Poland in November 2009. But in April, after Polish President Lech Kaczynski’s plane crashed in Smolensk, Russia, traffic on the site went up approximately 600 percent in three days. While Kniat refused to release page view stats for GazetaGazeta.com, the increase was so significant that he was afraid the server would not be able to handle the jump in traffic. “The last thing I want,” he says, “is for people to come to the website and they won’t be able to read it.” So he moved the articles to a separate server to prevent a meltdown. The English-language portal Polonium.GazetaGazeta.com debuted on April 22, 2010. That was 22 years after Zbigniew Belz started Gazeta, as the paper was originally called (Bonikowska insistsGazeta Gazeta is a completely new publication even though the revisions were slight). A year after he came to Canada as a political refugee, he realized the new wave of Polish immigrants after the fall of communism needed a way to get news about Canada in their mother tongue. In Poland, Belz had been a prominent leader in the Solidarity movement and founder of the underground newspaper Feniks (Phoenix), which still exists today. In Canada, he published Gazeta three times per week from 1988 to 1992, then increased the frequency to daily. The name changed to Gazeta Gazeta in July 2010, and the publication now has an average per-issue circulation of roughly 4,000, though it reverted to its original three-times-a-week schedule in 2008. With the advent of the internet, an increase in Polish-language programming choices in Canada and the dominance of mainstream English-language media, Belz felt that readers no longer needed a daily. Gazeta Gazeta may have switched its frequency over the years, but what remains constant is its place as a pioneer in the Canadian Polish language press. The web portal is not its first progressive move. In 1998, it was the first Polish paper to have a Toronto section, and in 2003, it became one of the first with a website that featured daily polish language news articles. Although mainstream newspapers had websites well before then, many Polish publications in Canada still do not, and if they do, many don’t have links and aren’t interactive. Circulation figures for some leading Polish-language newspapers show that Gazeta Gazeta must be doing something right—with its total 12,500 weekly copies, Gazeta Gazeta’s distribution exceeds that ofGlos Polski (Polish Voice), at 5,000 per week, Zwiazkowiec (The Alliancer), at 8,000 per week and Nowy Kurier (New Courier), at 10,000 every two weeks. And now, Gazeta Gazeta is one of the first ethnic newspapers in Canada to boast an English-language portal—a site that features news about Poland from international sources. It’s an attempt to solve the age-old problem of appealing to second- and third-generation readers. With each passing generation, immigrant families assimilate further into Canadian society and gravitate toward English-language media. If successful,Polonium could provide a model for other ethnic papers. Otherwise, it will demonstrate once again how difficult it is to make hyphenated Canadians interested in consuming news about their ancestors’ country of origin. It’s a humid day in July, and Kniat sits with his laptop in the back room of the new Gazeta store in the heart of Toronto’s Polish district, in the city’s west end. The 50-year-old, who has been involved with the paper since the 1990s, is working from the store temporarily while helping unpack and organize the new space. He clicks on his Google News tab and looks intently at a screen filled with today’s wire stories. Kniat subscribes to a number of RSS feeds, including Wyborcza.pl, a Polish wire service, and eight news agencies, including Reuters and Fox. One by one he considers each option. Kniat rests his cursor on a Bloomberg BusinessWeek story about how one of Poland’s biggest banks has been shortlisted by Allied Irish Banks, which is looking to make another major investment in the country. “I think it’s too business-specific for our readers,” he says, “so I will skip this.” He turns his attention to an article about how Spain is a favourite going into the European Football Championship, which will be held in the Ukraine and Polandin 2012. He skips it as well—articles, he says, should actually talk about Poland. He scrolls further and stops at another BusinessWeek story, which came in two hours ago and is entitled “Poland May Lack Budget Cuts for EU Deadline.” He likes this one. To avoid copyright infringement, he copies only the title and a small portion of the beginning of the story and pastes that on the site. If readers are interested in reading the full article,they can click on the link to the original story. Kniat, who updates the English portal daily, says that he devotes 20 minutes to it in the morning and maybe another 40 minutes in the evening. Bonikowska is responsible for the original Polish-language content on GazetaGazeta.com, and she spends about two hours a day on the site. It takes her husband, Belz, around seven hours to put Gazeta Gazeta’s print newspaper together by himself. Although he is not involved with the English portal, he supports it and hopes that Canadians of Polish descent will be inspired to learn more about Poland and actually visit the country—a land he thinks they will fall in love with. But is the portal the best way to accomplish this goal? Don’t underestimate the language barrier, cautions Vladimir Turovsky, publisher of the Russian-language publication Nasha Canada. He’s found that nobody can translate Russian articles into English. “It’s jokes. It’s a lot of literature, play with words,” he says. “It’s a very big problem for translators.” So while English news about Poland relays the facts, it can’t replicate native sentiment. Culture involves nuance and shared symbols. Without those, it’s just news about a country you happen to have ancestors from. Judging how many young Canadians are interested in news about Poland is difficult. The most widespread Polish student organization in Canada, Polska Inicjatywa Studentow w Kanadzie (the Polish Students’ Initiative of Canada), or PISK, has over 500 fans on Facebook and 150 registered members. Still, Kniatbelieves there is an audience for the portal. “There’s a part of the Polish community that assimilates into Canadian society and they just move on,” he says. He believes that not appealing to such people is short-sighted. But what if Polonium isn’t appealing to this particular demographic? Bonikowska says that she and Kniat got the idea to post English language articles on the site after hearing Polish immigrants often say that they wanted their children to learn about their ancestral homeland. But Zoe Tupling, a 20-year-old university student from Ottawa whose mother is Polish and father is Canadian, says she’d visit the site only for news of a big event. Even though she considers herself Polish, she says she is Canadian above all else: “Since Poland is not my home, it’s not that I have an incredible linkage to it.” Others more strongly identify with their heritage. “I would like to keep myself updated about what is happening in what I consider my country and my people,” says Monika Staruszkiewicz, a 20-year-old University of Toronto student who was born in Canada. However, even though English is her first language, she’d prefer to read the news in Polish so she can practise the language. She believes that the portal would be “absolutely ideal” if it provided a translation option. Polonium may be ahead of its competitors, but that may not be enough to attract young, wired Polish-Canadians. Every day, Kniat puts the most-read article from the portal on a Facebook group called Gazeta inEnglish. He hopes that it will serve as a teaser to get people interested in checking out what’s on the portal. The year-old Facebook page has almost 250 fans, suggesting some interest in Polonium. And almost 250fans is excellent compared to the seven that Polish News, a bilingual Polish-American portal, has. On the other hand, Global Voices’ English portal has over 9,000 fans. Polonium’s July 3 posting of an article from U.K.-based Polish recruitment agency Skills Provision, about how Poles are not welcoming to immigrants from Russia and Ukraine, is a case in point. It might have appealed more to readers if it included a personal story from a Pole living in Ukraine or a Ukrainian living in Poland about how isolated she feels being a minority in a foreign country. “You have to create something for people to get engaged about,” says Silverman. When used properly, Facebook and Twitter can be great assets. Butdialogue and conversation are essential for social media to be, well,social. The Huffington Post, Global Voices and naharnet, an English-languageLebanese portal, allow readers to follow the sites through various social media links, which are readily available on the front page. Naharnet has over 2,000 followers on Twitter. The ability to share Poloniumstories through Facebook, Twitter and other sites doesn’t mean much if people aren’t reading. At this point, it is up to Polonium to initiate a two way conversation, since the portal’s Twitter account, @poloniumgazeta,currently has only four followers, one of whom is Kniat. If not for a tragedy in Russia, Polonium might never have existed. What happened in Smolensk was a huge international news story—97 people died when a plane crashed. It was carrying the Polish president, the first lady and high-ranking government officials, who were on their way to the 70th anniversary of the Katyn massacre. The last big Polish event that garnered similar international attention was the death of Pope John Paul II in 2005. But the portal can’t rely solely on aggregated news stories forever. Since Poland is a country that is rarely front and centre on the world stage, people with no connection to it aren’t likely to seek out news about it or a site like Polonium. But the portal’s target demographic—young Polish-Canadians—might be. Still, it’s hard to believe that this group is really interested in a dry, obscure story about Poland planning to privatize major companies to offset the deficit. 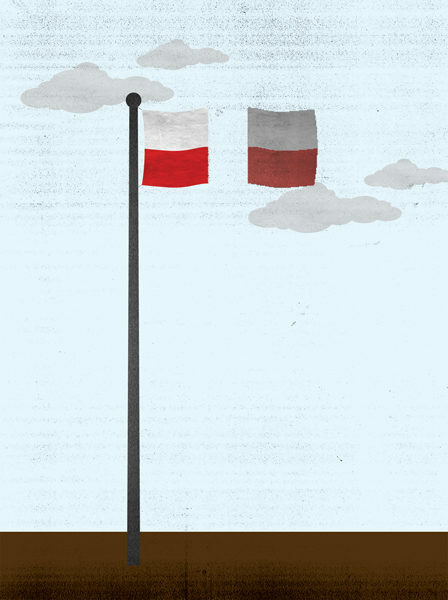 For many second- and third-generation Canadians, Poland is a foreign land, and the country’s minor political and economic dealings are of little concern. If the portal continues to post news stories without either critical analysis or some type of opinion and commentary, it will likely continue to maintain a Twitter following that can be counted on one hand. If the portal is to be successful, it has to do more than copying, pasting and posting and find a way to speak to the Polish-Canadian experience, or even the human experience. Readers must relate to the content and feel a sense of community. To do this, Polonium has to ask its readers what they want to know about Poland, rather than simply telling them. In the near future, Kniat and Bonikowska want to make the portal more interactive by adding a magazine section, which they say will include more critical analysis and original content. This idea has potential, but without a greater effort to reach out to young Canadians, it won’t work. And so far Bonikowska and Kniat have spoken with only one youth organization about the intended revamp. What Polonium needs more than anything is English-language content that sparks a conversation, not a monologue. Without that conversation, too much will be lost in translation—a different kind of tragedy, and one that is entirely avoidable. Phthalates are one common ingredient in many non-organic cosmetic and care items. improved allowing you to feel young and soft.